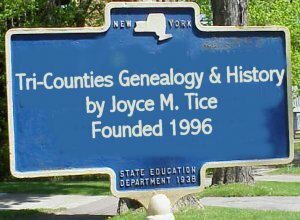 Do You Know that you can search just the 600 pages of Tioga County Cemetery Records on the site by using the Cemeteries -Tioga button in the Partitioned search engine at the bottom of the Current What's New Page? If you use that partition follow these steps to search just one cemetery. 1. 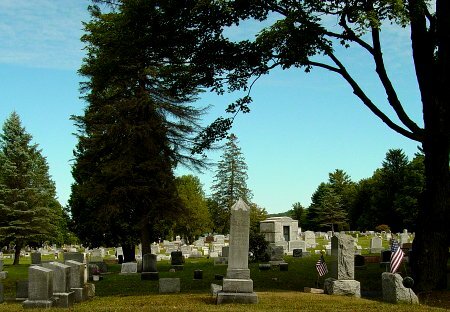 Choose Cemeteries - Tioga. 2. Enter part of the cemetery name [ie Newbury or Furman] AND a surname. 3. Choose the Find ALL Words option. Then it will find just the pages with that surname in the one cemetery you indicated. Gentry Emma 1849 1901 w/o Dr. J. M.
Base & Foot Stone R. E.
Putnam Viall A. Co G 58th Pa Inf. Burgin Jacobea Rudin 1816 1904 Born in Switzerland-On marker w/John J.
Cronise Minnie E. Burgin w/o Curbington E.
Wade Elma 7/14/1894 6/26/1993 On marker w/Earl C.
Mastin Charlotte E. 10/1/1852 3/18/1872 w/o Dr. N. W.
Mastin Nellie R. Roberts 8/30/1869 4/8/1934 w/o D. N. W.
Mastin Helen A. 10/4/1858 9/7/1903 w/o Dr. N. W.
Hathaway Gretchen 12/7/1888 6/18/1890 d/o G.M. & Lelia E.
Webb Mary C. 8/21/1859 9/29/1891 w/o C. W.
Brown Cornelia N. Aberenz 2/5/1822 3/7/1879 w/o E. J.
Barker Maria J. 1843 1895 On marker w/John R.
Barker Bessie 7/12/1885 16y3m d/o J.R. & M.J.
Toles Stella C. 1863 1894 w/o E. W.
Mather Lula C. 1894 1923 On marker w/Mary H.
Wheeler Mary M. 1852 1895 w/o R. A.
Sherwood Ida 9/11/1845 1849 d/o M. & H.A. Sherwood Caroline 8/14/1843 6/11/1876 d/o M. & H.A. Sherwood Harriet A. 4/3/1815 7/31/1889 w/o M.
Sherman Anna Welliston 10/7/1852 8/12/1900 w/o L. A.
Bacon Grace James 11/18/1871 12/17/1909 w/o John E.
Bacon Harriet B. 1915 2001 On marker w/John S.
Bailey Margaret L. 10/17/1827 11/19/1883 w/o J. W.
Russell Anna Belle 1870 1942 w/o George M.
Stowell Charlotte H. 6/10/1838 12/8/1926 w/o Devillo A.
Quimby Lillie G. 1864 1946 On marker w/Minor E.
Shaw Unicy L. 2/7/1838 11/9/1903 w/o Rev. A. C.
Smith Ralph P. 6/28/1851 11/21/1851 Children of S.R. & H. E.
If you are not navigating this Tri-Counties Site via the left and right sidebars of the Current What's New page you are doing yourself a disservice. You can get to any place on the site easily by making yourself familiar with these subject and place topics. Try them all to be as familiar with the site's 16,000 plus pages as you can. Stop groping in the dark and take the lighted path. That's also the only way you'll find the search engines for the site or have access to the necessary messages I may leave for you. Make it easy on yourself.